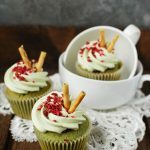 There’s a bit of a theme with the tea based recipes here, I promise I’ll give you a break after this one but I just couldn’t hold it in any longer these matcha and raspberry cupcakes are just too special. I love a cup of green tea, the health benefits are off the charts. It helps with bloating, is packed with antioxidants, boosts metabolism and lowers cholesterol. Matcha is the heavy hitting big brother of a normal cup of green tea, and boy is it delicious. I don’t drink coffee so a matcha latte is my favourite go to drink when we’re out and about. We’ll not mention the Starbucks version though, godawful! I was gifted a pot of ceremonial grade matcha tea from The Tea Makers a while ago, and I just couldn’t bring myself to drink it. It’s like killing a unicorn. So, instead I decided to incorporate it into some recipes and share the joys of matcha tea with my friends and family. 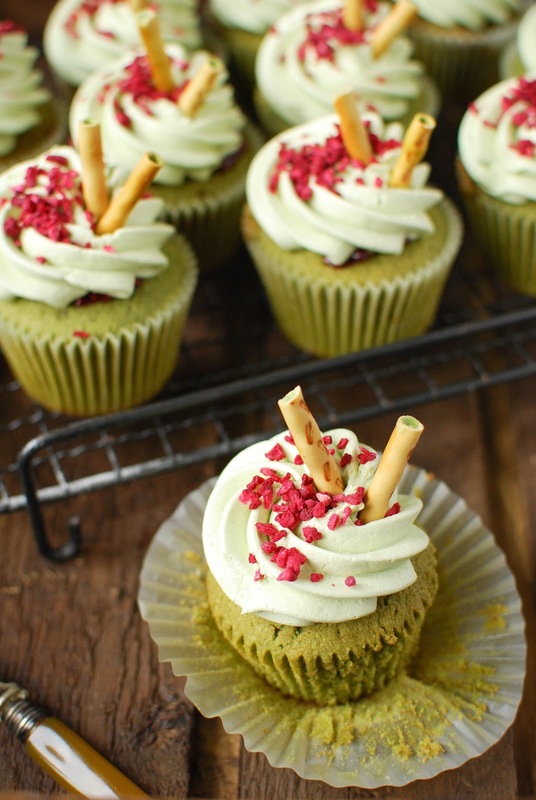 First up I baked up a batch of matcha and raspberry cupcakes and boy are they something special. I fed them to my boyfriends bandmates and they went wild, something I was just not expecting from a bunch of hairy musicians. I was overjoyed, these cupcakes are gold medal winners. Matcha has a bit of an earthy undertone, which I personally love, but it’s not for everyone. With that in mind I decided to fill the cakes with a sweet and sticky raspberry jam to balance out the flavour. 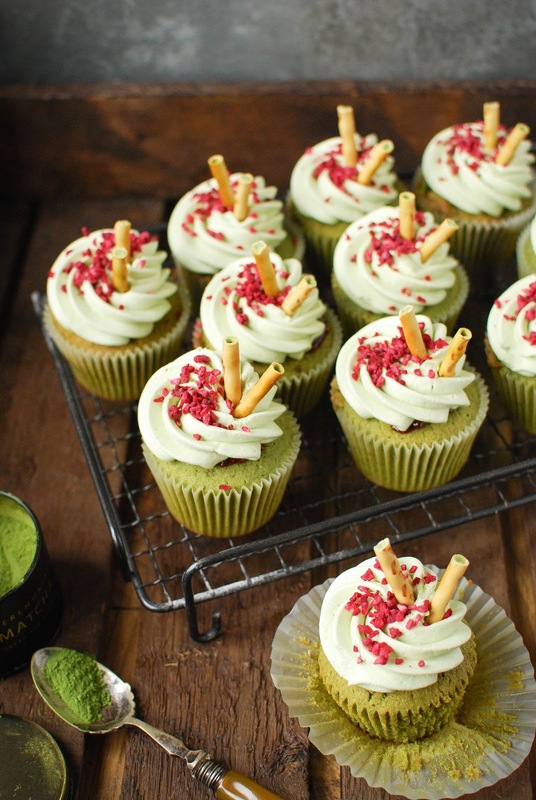 It worked perfectly, matcha and raspberry are a match made in heaven. I picked up these adorable matcha pocky from my local Asian supermarket for less than £1, and you can get freeze dried raspberries from Waitrose and Amazon. I love a cup of green tea, the health benefits are off the charts. It helps with bloating, is packed with antioxidants, boosts metabolism and lowers cholesterol. Matcha is the heavy hitting big brother of a normal cup of green tea, and boy is it delicious. Heat your oven to 170C and line a 12 hole cupcake tray with liners. Set aside. The the bowl of an electric mixer whip the butter and sugar together till light and creamy, around 3-5 minutes. Add the eggs one at a time mixing between each addition. Add half the flour and mix, add the milk followed by the rest of the flour, the baking powder and matcha powder. Mix till combined the mix in the vanilla extract. Using an ice cream scoop fill each cupcake liner to 2/3 full and bake for 20 minutes until risen and springy when touched. Allow to cool in the tin for 5 minutes before removing to a baking rack to finish cooling. To make the frosting first mix the butter in the bowl of an electric mixer until pale and soft. Add the icing sugar, matcha powder and the milk. Turn the mixer on low and gradually increase the speed. Whip for 5 minutes, if the frosting looks too stiff add a touch more milk until you reach a nice piping consistency. One the cupcakes have cooled take an apple corer or a small knife and hollow out the center of each cupcake and fill with raspberry jam. 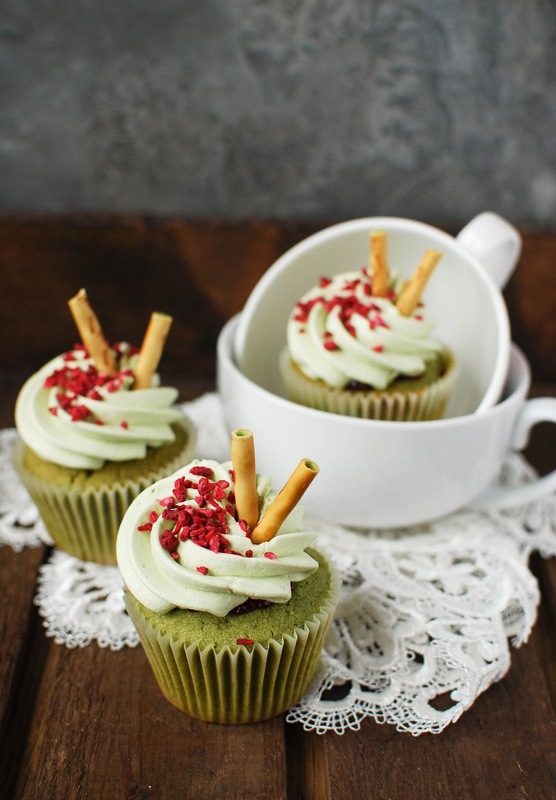 Fill a piping bag, fitted with an open star nozzle, with the matcha frosting and pipe a cute swirl on each cake. Sprinkle with the freeze fried raspberries and top with 2 pieces of the pocky. oooh I love matcha! Ive tried to cook with it a few times, but nothing quite so spectacular as this. I can almost taste them through your gorgeous pictures. Thanks for sharing – I'll be pinning for later!! These really do look like something special. I love the double hit of the raspberries in them.